1,745,156 active baptized members in the U.S. 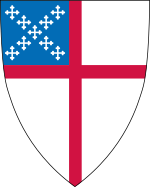 The Episcopal Kirk is a member krik o the wurldwide Anglican Communion bastit in the Unitit States wi dioceses elsewhaur. It is a mainline Christian denomination dividit intae nine stewarties. The presidin beeshop o the Episcopal Kirk is Michael Bruce Curry, the first African-American beeshop tae ser in that poseetion. ↑ 1.0 1.1 "Statistics" (PDF). 2016. This page wis last eeditit on 15 Februar 2019, at 03:01.